Official portrait of Jeanne Boleyn, taken in Venice, California, May 1974. "A crash course for the ravers"
This user is a California Gurl (on the prowl)..."Eureka!" This editor is a Labutnum and is entitled to display this Book of Knowledge with Coffee Cup Stain, Cigarette Burn, Chewed Broken Pencil, and Sticky Note. This user has been on Wikipedia for 11 years and 23 days. This user has created 334 articles on Wikipedia. 35 You have a new message. Hello, I'm Jeanne Boleyn. My real name is actually Jeanne, however most of my friends call me Jenny. (Yes, I do have friends, incredible as that may sound). 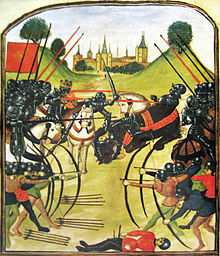 On 2 April 2008 I arrived as a user, due to my passionate love of history ( in particular the Middle Ages and Tudor England), and the desire to correct the many errors and omissions in Wikipedia. My first edit was to add a birthdate to the Virginie Amélie Avegno Gautreau (Madame X) article. 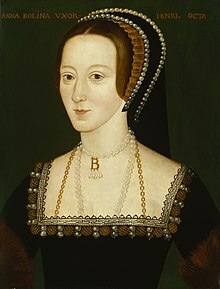 My favourite personages from history are Anne Boleyn, Barbara Villiers, Countess of Castlemaine, Margaret of Anjou, Mary, Queen of Scots, the Romanovs, the Sforza and Visconti families, Anne de Beaujeu of France, Richard III, King John of England, his consort Isabella of Angouleme, and the enigmatic, misunderstood "patsy" Lee Harvey Oswald. I am also interested in the recent, tragic period of Irish history commonly referred to as "the Troubles", as well as the Wars of the Roses, the Hundred Years War, the Crusader kingdoms and the Knights Templar. I have always been intrigued by the sinking of the RMS Titanic. Sensational crimes such as the Black Dahlia murder and Jack the Ripper killings interest me as do unsolved mysteries. I happen to be a Tarot reader as well as an astrologer, which is why I'm a stickler for exact birthdates. Throughout my life, I've held an odd assortment of jobs which I'll thankfully not itemise here due to the fact that I've happily forgotten most of them! I currently reside in Italy although I am not Italian. I am a member of the Tony Manero generation and was born in Santa Monica, California (lucky me), on 29 June in the year when rock-and-roll was young, Elvis was king, Marilyn the queen, and the world was innocently slumbering in Eisenhower-induced conservatism, completely unaware of the 1960s which was waiting in the wings, and about to catapult onto the historical stage with its neo-pagan celebration of youth, rebellion, creativity, individuality, and oh-so-wonderful music. I am the youngest child of four. I have two sisters, Judie and Carolyn, and a brother, Steve. I attended Venice High School (surf city, here I come) in Los Angeles (ah...El Lay, land of the flashy, rich movie star). I am, however, mostly self-educated, hold no degrees, and did not attend university. (I do not regret the latter!) I have also lived in Ireland, England, Texas, two weeks in Florida, and now Italy. I have visited Northern Ireland, Wales, Scotland, Canada, Mexico, and many American states. My ancestry is Irish (both Southern and Northern), English, French, and remotely Welsh, Scottish, and German. In fact, six of my maternal ancestors have their own articles on Wikipedia, including Adrienne Du Vivier, John Johns Trigg, George Walker, and Richard Townsend. My distant maternal cousin was Canadian hockey legend Bernie Geoffrion, also known as Boom Boom Geoffrion, and one of my direct ancestresses was a notorious La Baleine Bride. My zodiac sign is Cancer, with a moon in Sagittarius, and Aquarius ascendant. I have four children, Anton, Keith, Richard, and Tatiana (named after Grand Duchess Tatiana Nikolaevna of Russia); a big, bad gold cat named Tony and an affectionate, sprightly grey and white Aegean cat named Marilyn. I have dark green eyes, a dash of freckles across my nose, and am 5'8 tall (1.73). Currently my hair is long and dyed blue-black. I have a penchant for black clothing, black footwear, and black nail varnish, and I own a rather large doll, photo, and book collection. I am currently collecting DVD's of my favourite films (see list below). I am a Nancy Drew mysteries reader, and have been so since I was a young girl. In the summer, I spend every single day lying on a beach and swimming in the warm azure sea, alongside the jellyfish, speedboats, and lifeguards. My hobbies are reading, writing, photography, using the Internet, Tarot cards, studying astrology, genealogy, listening to music, watching films. I love discussions which can last far into the wee hours of the morning, dancing, travelling, and visiting ancient castles and places with a lot of atmosphere. I also enjoy going to car meets and watching Formula One on tv. I'm a fan of Michael Schumacher and Ferrari. Ironically, I do not drive a car myself (O irony, sublime irony!!) My favourite cities and towns are Venice (Italy), Taranto (Italy) Dublin, Belfast, Rome, London, Edinburgh, Tombstone (Arizona), and Taormina. My politics are rather right-wing; I'm a Monarchist, I believe in God and reincarnation, I am of the Anglican religion and I despise the current PC mentality as it restricts freedom of thought and smooth flow of speech. My social class is fluid, which basically means that I am intrinsically quite refined, and possess enough of the required social graces to mix easily in polite society, yet I am also street-wise, and if needs be, can find my way rather nicely around the gutter. I admit I have done so on occasion, but shall not delve further into that (Sorry but one must retain a bit of mystery, no?). I'm also a long-standing Rolling Stones fan. Keith Richards is my personal hero, my male alter-ego, and in my opinion, the greatest rock guitarist of all time!!! As far as Wikipedia articles are concerned, I am an inclusionist. Like Christmas presents under the tree, the more the merrier! As I'm just a wee bit opinionated (a trait I received from my Ulster forebears) I'm sure to annoy quite a few people. I shall now offer my apologies in advance. I do, however, strive to remain civil keeping only the merest trace of acid on my fingertips. I'm a Medievalist, or to use the local lingo, a Wikimedievalist (One has to always keep abreast of the current slang to maintain one's cool, hip, with-it image). Another bit of trivia: Back in the 1960s, I was a girl scout, but got kicked out for fighting and non-payment of dues! I prefer to use British English rather than American. I do not smoke nor do I imbibe alcoholic beverages to excess. This female also loves coca-cola, chocolate, Lapsang Souchong tea, lime Bacardi Breezers, Red Bulls (Olé! ), and Mexican food!!! My nicknames include Jenny, Medusa, and Lucrezia Borgia. My pet hates also include housework, cooking, ironing, and all other kinds of boring, mundane crap that consumes my precious time on this Earth. I also hate conceit, rudeness, condescension, sarcastic people, and those who use profanity to flex their muscles in a pathetic attempt to intimidate others with their balls-out stance. The fact that I happen to use profanity to excess is neither here nor there. I cannot abide dress codes at the workplace or other stupid rules of that sort. As of 22 May 2010, I've made over 45,000 edits, with my 45,000th edit being to the Barbara Villiers article. I have never broken the 3RR, nor have I ever commited an act of vandalism. I have, to my regret, engaged in a few edit wars, one especially unpleasant and viewed by many. Most of the articles and stubs that I have created have been biographies of medieval heiresses and noblewomen. I believe I have partially succeeded in bringing many long-forgotten figures from out of the lonely shadows of obscurity and into the dazzling light of historical recognition. My most gratifying edits have been contributions to the Anne Boleyn, the Troubles, Anne of France, Isabella of Angouleme, Margaret of Anjou, May Overthrow, the Dublin and Monaghan Bombings, and the Miami Showband killings articles- (these last two were extremely harrowing). My most difficult edit was fixing the grammar on the Caterina Sforza article. Well, I believe I've managed to adequately describe myself in one overlong essay. Don't like me? No? Oh well... c'est la vie (said with nonchalant neo-Templarian hauteur). Ciao for now! Oh, one last thing: The Beatles are gear and The Rolling Stones are the greatest rock band in the world! Go with the flow, man, or else you get the sh.t kicked out of you. Just picture yourself standing in the first couple of rows at an Aerosmith concert in 1978 amidst a seething, churning, agitated mob of drunken humanity and you'll get the picture. Keep cool Crazy boy/girl, keep it cool. Just like Ice in West Side Story. Cool. Occasionally one has to eat Humble Pie. Now, this is not such a bad thing, especially when it comes in the form of Steve Marriott. Yummy or more-ish as they used to say when I lived in Brighton. In addition to the three silver rules of survival, to edit successfully at Wikipedia, one needs the courage of Richard the Lion Heart, the hide of an elephant, the patience of St. Catherine tied to her wheel, plus a decent library certainly doesn't hurt. When all else fails, and you just cannot take anymore; head over to YouTube and watch a couple of your favourite music videos. That always serves to calm me down. My advice as must-see, good-humour-inducing videos are The Rolling Stones Faraway Eyes (yep), Pet Shop Boys Always on My Mind, The Doors performing Touch Me, Dexy's Midnight Runners Come On Eileen, Three Dog Night The Show Must Go On, The Beatles I Need You, Steve Harley and Cockney Rebel Make Me Smile (Come Up and See Me), The Small Faces Itchycoo Park, Kate Bush, Them Heavy People, Haysie Fantayzee John Wayne is Big Leggy, Adam and the Ants' Stand and Deliver, Fifth Dimension Wedding Bell Blues, Modern Romance Best Years of Our Lives (John Duprez playing his trumpet wearing a flight suit and goggles is priceless), Black Oak Arkansas performing Jim Dandy to the Rescue live, and The Undertones My Perfect Cousin. Isabel Bigod (29 June 2009) Feck, it was deleted!! Jeanne at the Bridge of Sighs. "Over Bridge of Sighs"
Sibyl de Neufmarché. Passed GA on 22 December 2010. Collaborated with Daicaregos, without whose help this article would never have made it to GA.
Miami Showband killings. Passed GA on 24 April 2011. Thank you, Daicaregos for all your tireless help and sage advice. I have also made considerable edits to the Omagh bombing, Dublin and Monaghan bombings, Ulster Volunteer Force, Lenny Murphy, and Bloody Friday (1972) articles. I added two sections to The Troubles, and I have largely expanded the Miami Showband killings, Billy Wright (loyalist), John McMichael, Jackie McDonald, Sammy Duddy, Jim Gray (UDA member), Abercorn Restaurant bombing, Sandy Row and La Mon restaurant bombing articles. I also promoted the Miami Showband killings article to GA Class. Let me add the caveat that my articles are not written with the purpose of offending, demonising, castigating or exonerating any group or individuals; but rather to inform readers of events that happened during this sad and bloody conflict, and the people who were involved. Virginie Amélie Avegno Gautreau, "Madame X"
Jeanne inside the Texas School Book Depository, Dallas, Texas January 2006 I shouted out who killed the Kennedys? I have appeared on RAI Italian national television; I also have appeared on several regional channels, and have been interviewed. I am a rock and roll baby. I was born to the sound of the Big Bopper, grew up with the music of the Beatles and Rolling Stones, and I now dance to the tunes of Yolanda Be Cool and Pitbull. Let It Loose Rolling Stones This 1972 song with it's skillful mix of sounds and genres is a triumphant manifestation of the musical genius that is the Rolling Stones. I'm glad I was around to appreciate it when it was first released. Accolades to Dr John. Heart Full of Soul The Yardbirds, with Jeff Beck on guitar-electrifying! Old Judge Jones Les Dudek Great song by a brilliant, underrated guitarist. Twas a wee bit disappointing, however, to discover his Confederate roots went back no further than 1959! Under the Boardwalk The Drifters Takes me back to the Santa Monica Beach pier in 1973. I can still feel the Pacific Ocean's breeze in my hair, hear the music blasting out, and taste the snowcones. Chantilly Lace The Big Bopper Number 1 song the year I was born-oops! Gloria Them One of the classic rock songs; nice and raunchy in the Belfast style. Yes All Night Paper Boy DJ mix (2005) (Sailing on a dream.....) That line sums up my entire life. Here Comes the Night Them Brilliant...One can hear Van's Belfast accent throughout the song! Paradise Coldplay This is epic! Jeanne in early 2008, "Welcome to my time dimension"
Jeanne in 1994. What do you say? Say "hey"
These are some of the famous people who have insulted me in the past, for various reasons which I'll not elaborate on here. They include Mae West, Candy Clark, Cindy Williams, legendary singers Teena Marie (RIP Tina) and Billy Bragg, the wife of Finbar Furey, a noted Tudor historian, several popular Los Angeles disc jockeys including Wolfman Jack, and a gang of quite notable groupies (male and female) outside Rodney Bingenheimer's English Disco on Sunset Strip in 1973. (The gang did not like my Venice Beach style, Indian-print crop-top and I wasn't in my No More Mr. Nice Guy mode that day). I should also note that none of those groupies, in all likeliness, would have been able to locate England on a map nor name a famous English person who was not a member of a rock band. Hey, if you're going to sing, then sing, don't talk. You are paid to sing and/or play a musical instrument, not pontificate. We didn't hear The Big Bopper preach politics on stage before he sang Chantilly Lace, Mick Jagger didn't fire off a spitting tirade against President Richard Nixon when I twice saw him and the Stones play at the LA Forum; and we didn't have to suffer through Freddie and the Dreamers doing a Talleyrand routine when they performed I'm Telling You Now on the Ed Sullivan Show. You could have chosen to charm the bouncer into letting you through the front door into the rarified world of politics; instead you opted to enter by the back door, in the guise of a rock star, cherishing the hope that it would prove a launching pad on your rocket trip to power. You are, however, destined to be absolutely and utterly disappointed as you're never, ever going to be Tony Blair. Accept it, shut up, and get over it. "Come on, come on make love to meeeee" - Guy in my street in West LA, 1972 as he squeezes his crotch. I was only 13 at the time. Hornball. "Your first lover should be a Capricorn" - New Yorker by the name of Dennis doing my chart in Hollywood, 1972 (He just happened to be a Caprickorn!!!) I was 14 at the time. Hornball. You constantly tell your kids to "turn that damn music down"
I oppose the war in Iraq. (Make bombs not war). I oppose attacks against all organised religions. A person is free to be an atheist if he or she chooses, but don't knock people who believe in God, Allah, Jesus, or Buddha. I oppose the burning of flags in public, and catcalling at stadiums during the playing of national anthems. I STRONGLY CONDEMN the terrorist attacks which are still going on at this moment in Bombay, and I offer my condolences to the families of the dead and injured. I STRONGLY OPPOSE the sentence of execution laid upon Tariq Aziz. Why does he have to die? I STRONGLY OPPOSE the lapidation of Sakineh Mohammadi Ashtiani. We are living in the 21st century, not the Stone Age!! Her life must be spared! I ABSOLUTELY CONDEMN the Moscow Airport bombing and wish to extend my deepest sympathy to the families of the dead and injured. I TOTALLY AND VIGOROUSLY CONDEMN the barbaric slaughter of those magnificent tigers, lions and bears in Ohio. As usual, animals have to pay the price of human ignorance. Couldn't the morons have used a tranquiliser gun instead of destroying the beautiful, splendid creatures? I adamantly oppose the wanton demolition of all the priceless Victorian and Edwardian buildings in Belfast-one of my favourite cities of which I have so many pleasant memories. It was bad enough the planners wiped out Sailortown, Pound Loney and so much of Sandy Row, the Shankill and Falls. Do they have to obliterate the City Centre as well?!!!! The recent spate of files being deleted at Commons with no sign of slowing down. This bodes ill for the quality of Wikipedia articles. In the future, will landscape photographs have to be copyrighted to God? In loving memory of my cousin Jack Rorke, and his son Michael. May you both rest in peace and forget the ugly and undeserved cruelty that beastial mankind foisted upon you both in the decade when everybody should have been having fun. "Time, his script is you and me"
Millbanks, a nice, decent chap even though we'll never see eye to eye on the European Union-Sorry! Welcome to Jeanne Boleyn's nightmare. 1976 going on forever into infinity, "I want you to show me the way, everyday, I want you....."
You have a new message. This user is of French ancestry. This user has Scottish blood flowing through their veins. This user is of Viking ancestry. This user is interested in the History of France. This user is a Francophile. This user is interested in the history of the lands comprising the United Kingdom. This user lives in Italy. This user is a Cancerian. This user is interested in the Renaissance. This user once wanted to be like Joan of Arc but then read how the story ended. TD This user is a rider on the storm. This user believes in reincarnation. This user is interested in ghosts. This user is interested in tarot reading. ND This user loves the Nancy Drew books. This user is a swimmer. This user supports the restoration of the Tsar and the Russian Empire as a Constitutional Monarchy. This user wishes that France will become a Constitutional Monarchy. This user is a feminist. The Ugly When this user has to shoot, he shoots. Doesn't talk. This user is opposed to communism in both theory and practice. This user believes in LaVeyan Philosophy. You shoulda heard this user just around midnight. This user is a book lover. This user considers herself self-educated. This user loves to write. This user is always fascinated as she searches her family history and build a family tree to see what black sheep will turn up next. PC-0 This user is politically incorrect. A fact from the article [[Bianca Riario Janet Beaton ]], which this user created or significantly contributed to, has been featured in the Did you know... section on the Main Page. This user loves RMS Titanic. This user remembers the Fifth of November. This user believes any answer I give will be wrong and the Senior Drill Instructor will only beat this user harder if I reverse myself. This user is a member of the Middle Ages WikiProject. This user has been identified as an Awesome Wikipedian and was awarded her own day. This page was last edited on 14 April 2018, at 15:32 (UTC).